The American Haiku Archives is open to anyone during the California State Library’s regular business hours, and welcomes both formal and informal research of its collections. Basic guidance on how to conduct research online and in person is as follows. As of January 1, 2008 the American Haiku Archives included approximately 2,313 indexed records. Many of these records, such as magazines, include multiple items. Please note that the library receives new haiku materials regularly, and recent donations may not be archived and catalogued immediately (due to the painstaking archival process). In addition, items such as papers, letters, or nonbibliographical items may not be listed in certain online catalogs. Visit our Sample Searches page for more detailed instructions and examples of what your search results might look like. If you wish to visit the archives, you may want to contact the California State Library to inquire about research procedures. Please see the library staff contact list or contact a member of the American Haiku Archives advisory board for advice. Michael Dolgushkin, as the principal librarian in charge of special collections (including the American Haiku Archives), is the best person to ask for guidance on visiting the archives and conducting your research. 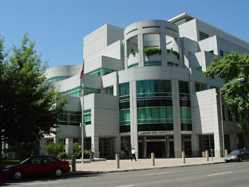 To visit the American Haiku Archives, go to the Library and Courts II Building at 900 “N” Street (at the corner of 9th and “N” streets). If street parking is not available, a convenient place to park is under Macy’s on L Street. Additional directions and parking details are available at California State Library website or on our Archive Location page. Go up to the second floor by stairs or elevator, and enter the California History Room. Ask a librarian or desk attendant for the items you want to see. That person will check your requests against the contents of the archives and will have your requested material brought to you in the California History Room. You might want to bring change to photocopy material, as permitted. Also bring a pencil in case you want to take notes—pens are not permitted. Return the material you use to the librarian. Please note that materials are not available for loan or other removal from the library. The California State Library, typically at the instigation of the American Haiku Archives advisory board, occasionally holds special tours of its haiku collections. On these tours, you can visit the climate-controlled stacks to see all the haiku books and archival boxes of correspondence and other materials held in the collection. Tours sometimes include a visit to the library’s archival labs and provide views of other behind-the-scenes rooms and collections. For more information about a possible tour of the haiku collection, please contact the advisory board. See the American Haiku Archives Visitor Comments page for a better sense of what to expect.